There are those who don’t like using two way radios or any other form of technology when hunting. Why? Well, according to them, such technology tarnishes the image and concept of “true” hunting. But the hard truth is that we all live in a different era now. If the best two way radios for hunting were in existence some five decades ago, our ancestral hunter-gatherers would have used them without any qualms. So, if you’re still on the fence about using hunting technology, it’s time you try it out and reap the benefits. Two way radios make it possible to keep in touch with your hunting party, friends and family when you’re out in the wild. What’s more, they make it easy for hunting buddies to team up quickly and track prey. These gadgets have also proven useful when it comes to receiving important weather alerts. Even though two way radios will never provide the clarity of cell phones, they are able to give you reception in very remote areas where you can’t get cell signals. That said, it is not surprising that the popularity of two way radios has increased significantly among hunters. They have become so popular to the extent that radio manufacturers are now making two ways that are specifically tailored for hunters. Given the myriad of two way hunting radios on the market, choosing one can be a bit difficult. But not to worry; this article covers everything you need to know about two way radios for hunting. 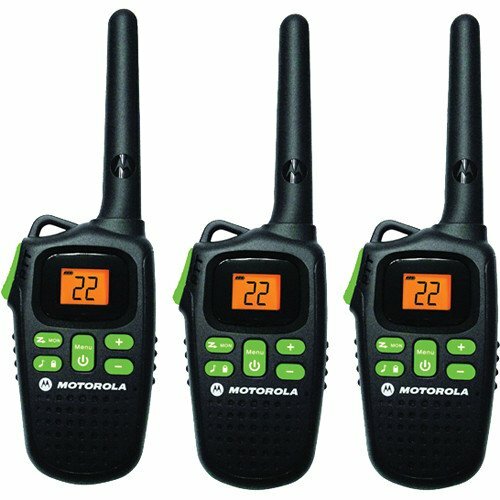 The 3 best two way hunting radios are the Motorola MT350R, Motorola MR350R FRS/GMRS, and Motorola T600 Talkabout Radio. We choose these two way radios because they have superb range, a wide range of channels and tons of emergency features, which come in handy when you’re hunting in the wild. ​Even though most two way hunting radios are advertised as having at least 35 miles or more in reception, this is only possible in completely flat and unobstructed areas. Realistically, most of these radios have a range of three miles or more. Getting ideal reception in dense woods is nearly impossible. Thankfully, manufacturers understand this which is why they incorporate other features that boost the range of two-way hunting radios. These include a longer antenna, built-in repeater channels, adjustable wattage just to mention a few. The benefit of a repeater channel is that it can transmit signals via a local repeater station; hence boost the range of your radio. ​The National Oceanic and Atmospheric Administration (NOAA) alerts are important because they notify you of inclement weather conditions. This way, you can seek refuge in a more secure place or return to your hunting crew in time. ​Most of the current two-way hunting radios are designed in such a way that they blend nicely in the forest or with other hunting gear. Even though this is not a must-have feature, it’s a good nice-t-have. If you choose to go for camouflaged two-way hunting radios, ensure you don’t drop them as they be harder to spot, especially in foggy or dark conditions. As you hunt, your two way radio is likely to be exposed to dust, mud and rain. Consequently, you’ll want to go for a model built of sturdy materials and one that won’t get damaged the minute it falls in a puddle. In fact, the best two way radios for hunting are fully submersible. Such a feature will come in handy if you like hunting in marshy locations or areas with lakes and rivers. ​The last thing a hunter wants is to spot the perfect prey and then spook it with the beeping sound of his hunting 2-way radio. To avoid this, ensure you go for the best two way radios for hunting as they operate silently. If you’re looking for a two-way hunting radio that has all the bells and whistles, the Motorola MS350R does not disappoint. Being a waterproof radio with IP-54 rating, the MS350R is almost impenetrable to dirt and other unpleasant weather conditions that you’re likely to encounter as you hunt. A key highlight of the Motorola radio is the availability of NOAA channels, which keep you updated on emergency alerts. So if there’s a flash flood or thunderstorm on the way, you will be notified ahead of time. Another thing the MS350R has going for itself is the compact size. 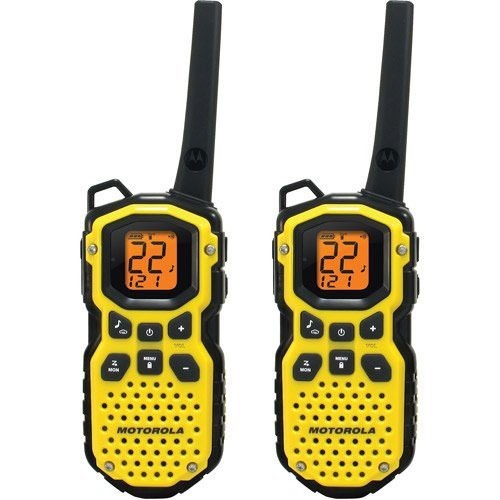 Included in this package are two 2-way hunting radios, each of which measures 7.89” by 1.57” by 2.81”. Thus, they take up very little space in your camping or hunting gear. Equipped with 22 channels, each offering 121 privacy codes. Provides a range of 35 miles or more. Weatherproofing design- can operate in snow, rain and dusty conditions. There have been complaints of a few units arriving when they’re dysfunctional. Summary :- With a range of 35 miles, a weatherproofing design and 22 channels, the Motorola MS350R is perfect for every hunter. These radios are designed with state-of-the-art features that improve your hunting experience considerably. 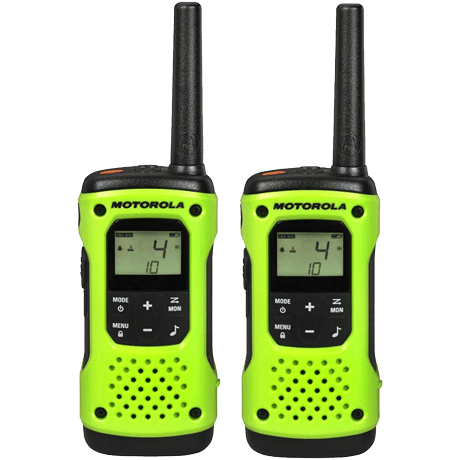 This model from Motorola is another top-rated two-way radio. In fact, the only difference between this and our top pick is that this one is a little pricier than the first. The Motorola MR350R has several features that make it the ultimate two-way radio for outdoorsy individuals. With an extensive range of 35 miles, you’ll be able to explore the outdoors while still keeping in touch with your family or hunting crew. This two-way radio boasts a lightweight design. Plus, it has ultra-large buttons, which you can operate with your gloved hands. Still, the MR350R is designed to tackle any challenge that may weigh you down. It also has NOAA weather channels that help you know the weather in advance. Can work with either 3 AA alkaline batteries or NiMH batteries. Comes with a charging adaptor and an emergency preparedness checklist. Includes a user’s guide to get you started on operating it. Large buttons make it suitable to operate with gloved hands. Summary :- The pair of two way Motorola radios are ideal for your hunting and camping expeditions. They have an extensive range, VibraCall vibration alert feature and 22 channels, each of which has 121 privacy codes to provide superior interference protection. Motorola T600 is a two-way radio that stands out, quite literally. 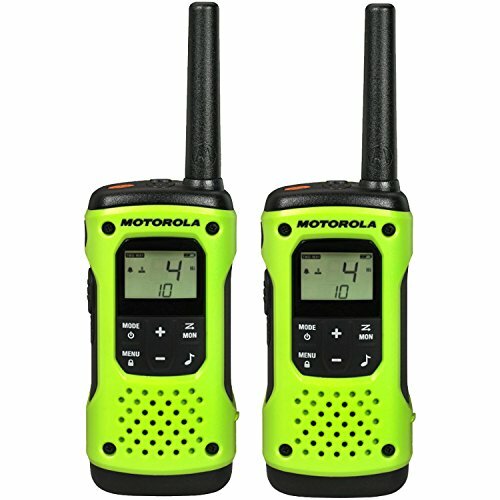 Available in a lime green color, this radio combines a waterproof design and a flashlight into an easy-to-use handset. Essentially, this to-way radio comes as a pair of two handsets. Each one constitutes a durable and sturdy plastic build, which is also waterproof. This means that if you accidentally drop your radio in a stream or river, it will float up to the surface with its face up. The LED flashlight is designed to work in tandem with the waterproof feature so that it lights up anytime it comes into contact with water. This way, you’ll be able to spot your radio faster. Another exceptional feature of the Motorola T600 is its broad compatibility. 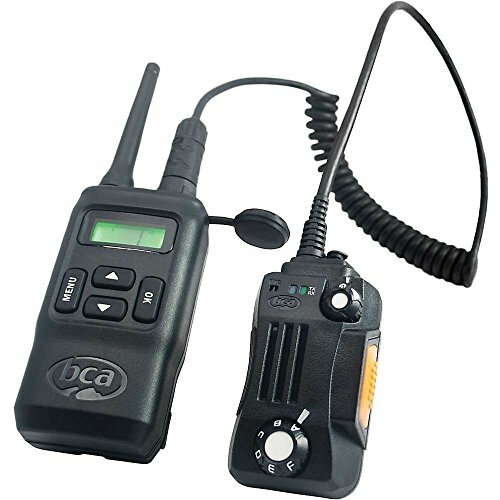 You can use this radio to communicate to all FRS/GMRS radios even if they don’t belong to the Motorola brand. It’s also equipped with a Push-to-Talk (PTT) power boost, which enables you to increase power temporarily when needed. Compatible with other two-way radios. Waterproof design and floating capability. Comes with a built-in flashlight. NOAA weather alerts and a hands-free operation. Numerous channels- has 22 channels along with 121 privacy codes. The LED light is positioned in such a way that makes it prone to activation even when you don’t need to use the light. Summary :- Overall, the Motorola T600 has proven useful, especially if you’re hunting in water or inclement weather conditions. It provides a reliable range and clarity. Plus, it can float. 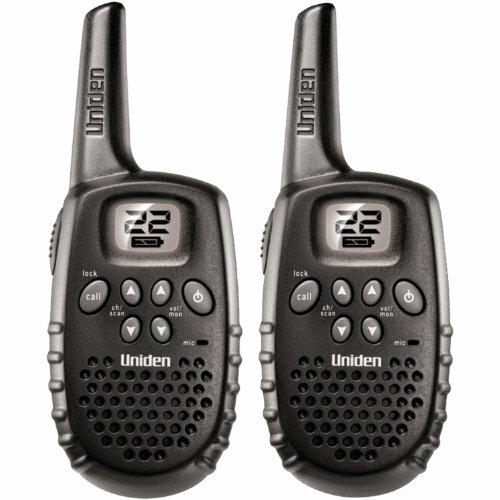 Equipped with superb 5-watt power, this two-way radio gets about 36 miles of range in optimal conditions. In urban settings, this range decreased understandably up to about 2 miles because of the presence of obstacles. The Midland two-way radio comes in three colors: black, black with bits of yellow or Mossy Oak Camo, which blends in perfectly within the forest elements. Apart from the extensive range and handy camouflage, the GXT1050VP4 incorporates other features, which include a hands-free operation, NOAA Weather Alert and SOS. Offers private communication- the radio has 22 channels and 28 additional channels each with 142 privacy codes. The longest range of about 36 miles. Quiet operation- allows you to silence tones and use vibrating alerts to avoid spooking prey. VOX- it has 9 levels of hands-free operation. The Camo design is ideal for a range of hunting environments. Not the best two-way radio for an urban setting . Summary :- If you’ve been looking for a two-way hunting radio that has a long range, the Midland GXT1050VP4 is your best bet. 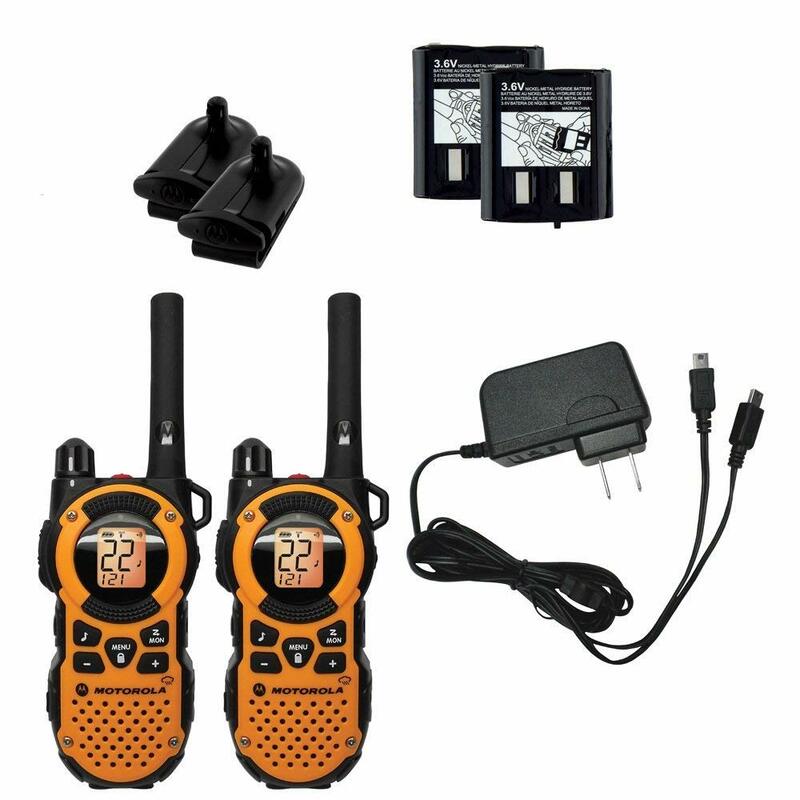 Have you been looking for a two-way radio that you can use in all your outdoor activities? If so, the Cobra MR HH450 is the ultimate multi-functional two way hunting radio. 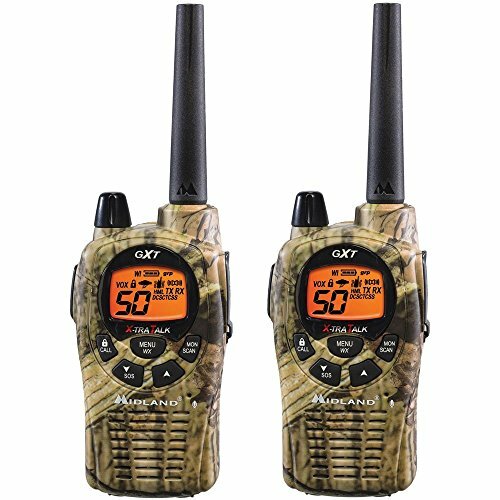 With this two way radio, you can communicate with your hunting party whether you’re on land or open sea. The Cobra HH450 serves as a VHF marine radio and a GMRS transceiver at the same time. With just a click of a button, you can switch from VHF bands to the GMRS. The two way radio supports about 15 channels and 88 marine frequencies. It also boasts 10 NOAA channels alongside S.A.M.E weather alerts. Being such a powerful two way radio, it’s not surprising that it’s powered by a 1000mAh Lithium ion polymer battery pack. The radio can also use AA alkaline batteries. In fact, it comes with a battery case so you’ll be able to carry your favorite batteries wherever you go. Another distinct feature of the all-terrain-radio is the big backlit LCD display. This one lights up the keypad, making it easy to use even in poorly-lit areas. Furthermore, the Cobra HH450 is designed for extreme conditions. Featuring a rugged build, this radio adheres to JIS7/IPX7 standards, is waterproof and it can float. Equipped with advanced GMRS scan, which allows you to scan either channels. Backlit LCD display for improved visibility. Comes with a rechargeable lithium battery pack. Has a VOX mode or hands-free operation. With the GMRS mode, the volume of the speaker is too low even when it’s set at maximum. Summary :- The Cobra MR-HH450 is a superb multipurpose two-way radio. It doubles up as a VHF marine radio and a quality GMRS transceiver. The Uniden GMR1635 offers several features. For instance, it has 22 channels, which include 7 FRS and 15 GMRS channels, enabling you to communicate on multiple levels. FRS uses a lower wattage and has a shorter range while the GMRS boasts a longer range due to high wattage. Another highlight of this two way radio is the full scan feature, which makes it easy to find other people in your area. This device also has a transmission range of 16 miles of coverage, which is sufficient to help you stay in contact with your hunting crew. When you buy this two way radio, you will also get 3 AAA batteries, a user’s guide and a pair of belt clips. Equipped with a call tone and Roger beep to notify a user when transmissions are starting and ending. The automatic squelch system eliminates weak transmissions and unwanted noises. Has a unique circuit that helps extend battery life. It does not NOAA channels. Summary :- Whether you’re on a hunting or hiking expedition, the Uniden GMR163 is a fantastic two-way radio that will help you keep track of your fellow explorers. It has convenient features such as call tones and roger beep. The Garmin Rino 750 is another top-rated two way hunting radio. Fitted with a GPS navigator, this radio is among the devices from Garmin under their outdoor segment. 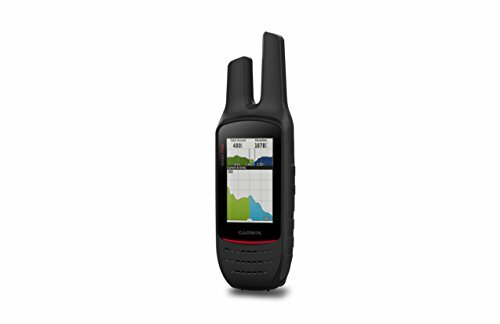 Although a bit pricier than other two way radios, the Garmin Rino 750 has a lot to offer. For one, it has a highly sensitive GPS and GLONASS satellite reception, providing superb tracking of an environment, even when there’s inclement weather. It’s also equipped with Bluetooth audio headset receiver, facilitating better voice communication. This two way radio can also keep you updated on weather changes through the Active Weather forecast feature. And with the Emergency Alert capability, you can contact up to 700 other Rino users in case you need help. Features a rugged, handheld design that makes it ideal for hunting, hiking and exploration. The touchscreen is easy to read and offers dual orientation. Battery life can extend to more than 14 hours. Allows you to communicate either by radio or via text message when linked to a phone. Equipped with an emergency alert system for improved safety and convenience. Summary :- Garmin Rino 750 is a present-day evolution of the traditional walkie-talkie. It’s more expensive than other two way hunting radios in our review. But for the extra investment, you get a large touchscreen display, ABC sensors, active weather forecasting, smart notifications and wireless communication system. Another one of the best two-way radios for hunting is the Uniden Atlantis 270. It’s designed for those hunters who engage in other outdoor activities like fishing, kayaking, and boating. This two-way radio is a type of VHF or ‘Very High Frequency’ marine radio. What this means is that it allows individuals to communicate with other boats, lock operators and other people when you’re on sea, lake or river. Like many other hunting radios in this review, this one also has NOAA emergency weather channels; hence, keeping you in the know when the climate changes. Another plus of this two way hunting radio is that it has all USA, Canadian and International channels. And with a 6 watt output, this radio gives you a strong signal over a large area. It has a mile range of about 5 to 7 miles. This handheld two way radio is rated at JIS7/IPX7, which means that it can withstand being immersed to water depth of 1 meter for half an hour. If you accidentally drop it in salty water, all you have to do is rinse it with fresh water then leave it to dry; it won’t incur any damage. Allows you to monitor and also save channels on it. Boasts a 10-hour battery life. Submersible to 1-meter depth for half an hour. Comes with AC and DC adapters. The battery is not the best for extended use. 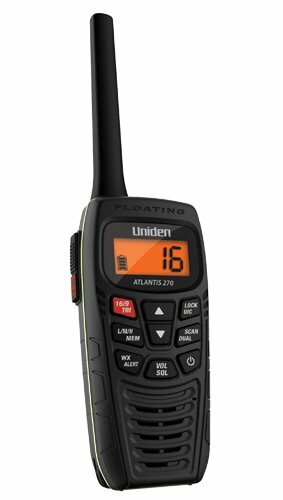 Summary :- If you’re an all-round outdoorsy person, then you will appreciate the features of the Uniden Atlantis 270, which doubles up as a marine audio. 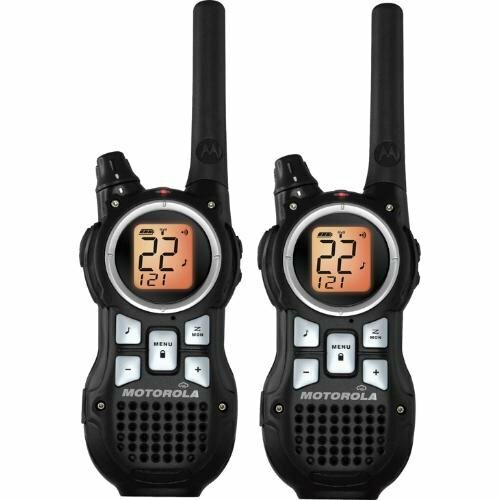 The Motorola Talkabout 2-pack radio is a budget-friendly option for hunters looking to save money when buying two way radio systems. 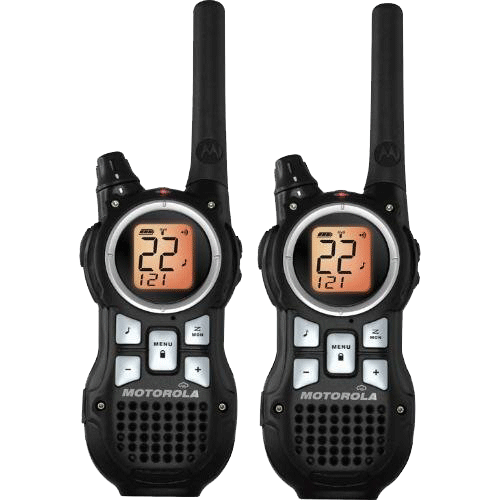 Even with such a reasonable price, the Motorola two way radio has plenty to offer. For starters, these radios boast a weatherproof design, which can withstand inclement weather. They have IP-54 rating, making them suitable to use in dusty and wet weather conditions. Secondly, the two-pack radio flaunts a full-featured privacy. Thanks to the QT (Quiet Talk) feature, you can set the radios in such a way that they can communicate with other Motorola products. Plus, this two way radio helps you enjoy numerous hours outdoors owing to the long battery life. The only drawback of this two way radio is 20-mile range, which is one of the lowest compared to other two way hunting radios in our review. Dual power for extended use. Does not have the best range. Summary :- Although it’s among the cheapest two way hunting radios, the Motorola Talkabout disappoints when it comes to range. With just a 20 mile range, this radio might not be the best fit if you’re hunting in a remote area with poor reception. But other than range, this two-way radio offers almost identical features as our top pick. The Backcountry Access Link radio system is the best when it comes to communication within a large split group. When hunting, communication can be impeded by howling winds among other factors. But with this radio system, you can keep in touch with your hunting buddies at all times. The first thing you’ll notice about the BC Links Radio is its simple interface. With some two way radios, you have to read a long manual and spend hours figuring out how it works. But not so with this radio, which has all the major controls on the Smart Mic. The mic is usually clipped to your backpack strap while the radio’s main unit is stowed safely inside the pack. By keeping the base unit inside your pack instead of strapping it to your body, you minimize the chances of losing the radio and also reduce the likelihood of interference. Like our top pick, this radio also boasts a waterproof design that meets IP56 standards. Put simply; it means that the radio is dust-protected. Designed for use with all backpacks. Comes with a push-to-talk button. Equipped with a secure cord connection and alligator clip for strapping on your shoulder. Requires a lot of precision when pressing the push-to-talk button otherwise your message will not be transmitted. Summary :- The BC Links Radio is compact and user-friendly enough for individuals who’ve never used radios before. Professional hunters understand just how crucial it is to keep in touch with their hunting party when they’re chasing after quail, big game or any kind of prey. In such instances, you cannot rely on cell phones as they won’t have good reception in remote areas. This is where two-way hunting radios are essential. When determining the best two-way hunting radio, we spent over two weeks researching, testing and comparing different models. We first conducted a survey to identify the most important two-way radio features that hunters value. From this research, we discovered that most of them focus on the range, price, battery life, emergency alert features and number of channels. So based on these specific factors, we narrowed down our list of ideal two way hunting radios to 15 models. To find the very best two-way radios, we tested the 15 in a dense forest setting and assessed their performance. More specifically, we evaluated their reception on a backcountry hunting trail near Tongas National Forest, which was outside cellular service. Through this process, we ranked the best two-way radios starting with the top-rated model to the most affordable one. One thing you’ll notice is that a majority of the reviewed two-way radios have a decent number of channels, weather alerts, and emergency alert features. These aspects are very important for hunters. How do two-way radios Privacy Codes Work? Two-way radios have only a few channels, and these are based on the frequencies assigned by the FCC. As a result, there’s always a possibility that a third party is using the same channel you’re using. To avoid this, many users opt for privacy codes. Privacy codes are founded on the continuous tone-coded squelch system (CTCSS) and digital-coded squelch (DCS) encoding systems, which work by filtering out certain frequencies. If the recipient radio has a privacy code, then it will not un-mute its speaker. The only time it can do so is if the code is sent along with the transmission. To illustrate this- if the recipient radio has been set to channel 3 and privacy code 4, then the transmitting radio should also be set to an identical channel and code. This way, individuals can communicate between two radios without any interferences. Alternatively, you can designate a group set so that your entire hunting party is set to the same channel and code for effective communication. Know the optimal range of your two-way radio. You should first test out your radio based on the environment where you plan to use it. Although manufacturers state the range of their radios, most of them use the best scenarios during testing. So if you will be using it in a mountain terrain or an area with many obstacles, this range is likely to reduce. Consider the battery life- the optimal duration that each unit works for varies depending on the brand. Before going for a hunting or other form of expedition, ensure your two-way radio is fully charged. Whenever possible, go for the same models and brands for your entire hunting group. This will provide a more fluid communication. Plus, you won’t have to worry about compatibility. If you go hunting with family and friends on a regular basis, then one of the best purchases you can make is a two- way radio system. With this gadget, you’ll be able to keep in touch with your hunting crew even if you will be miles apart. Having two-way radios can also keep your group safe when hunting.